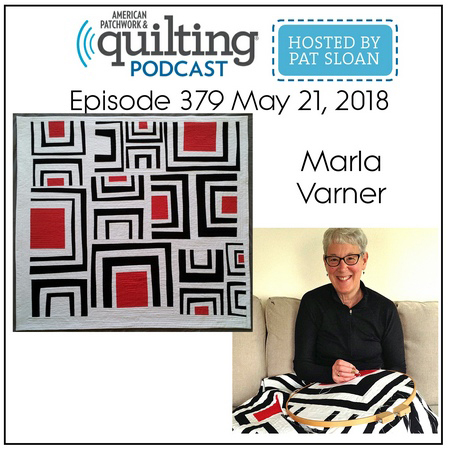 It was so much fun chatting with Pat Sloan on her podcast today! I appreciate her enthusiasm and love listening to her weekly interviews. 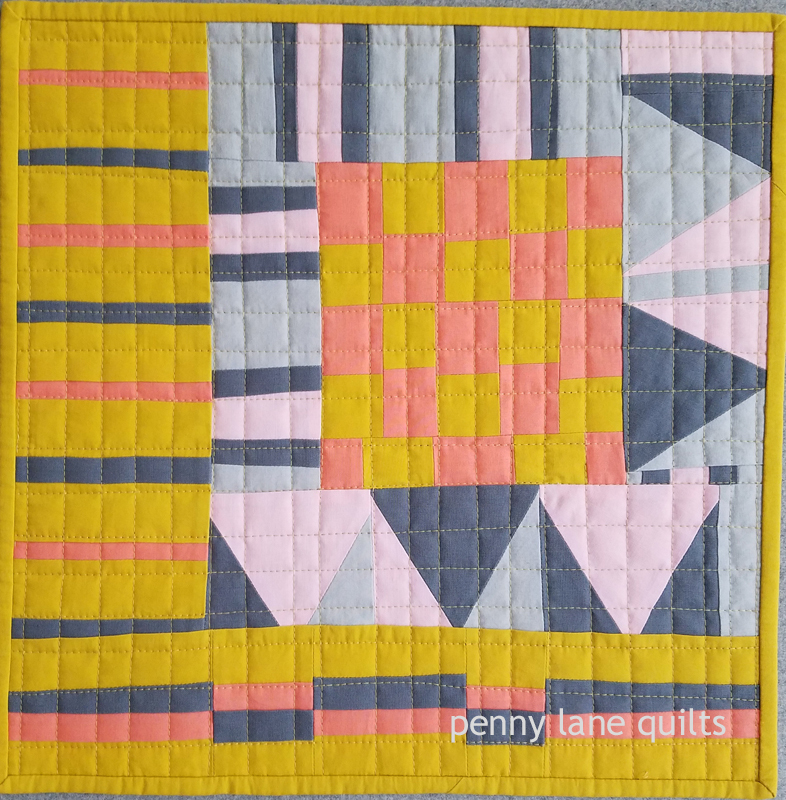 We briefly discussed a wide range of topics including my quilt making journey, the sewing machines I use, dyeing fabric, hand quilting and my business, Penny Lane Quilts . 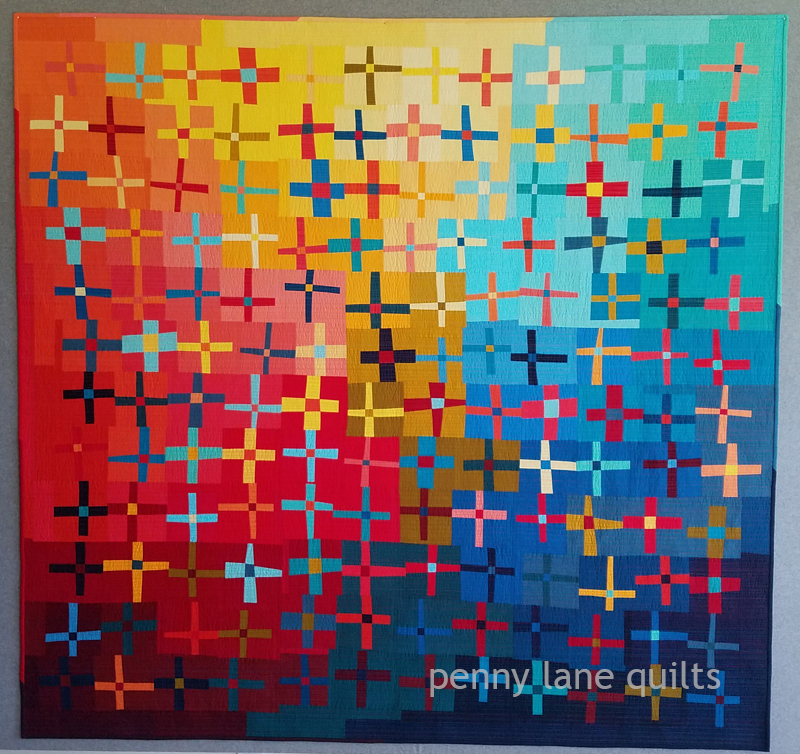 Listen to the podcast now to learn a little more about what I do here on Penny Lane. I hope you enjoy the show and I’d love to hear your thoughts. How exciting it was to receive this book in the mail! 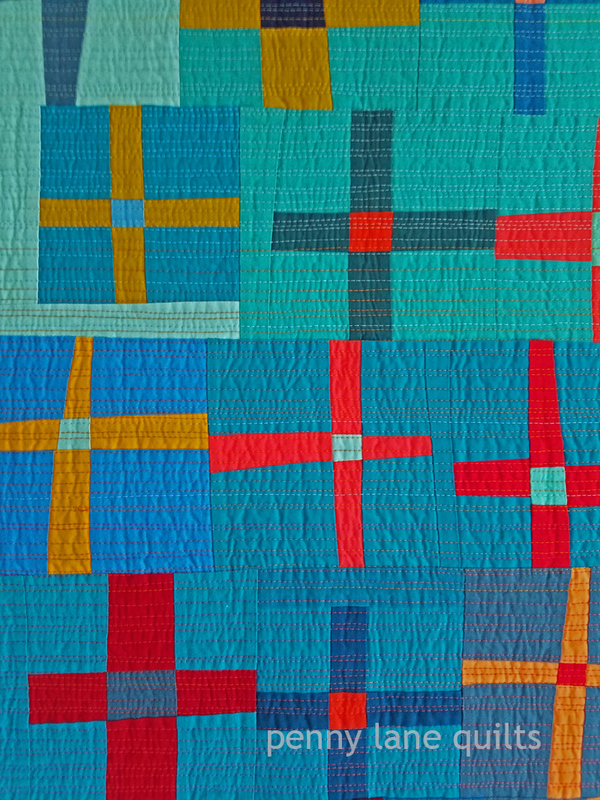 Each day I spend a little time enjoying the quilts and thinking about their makers. 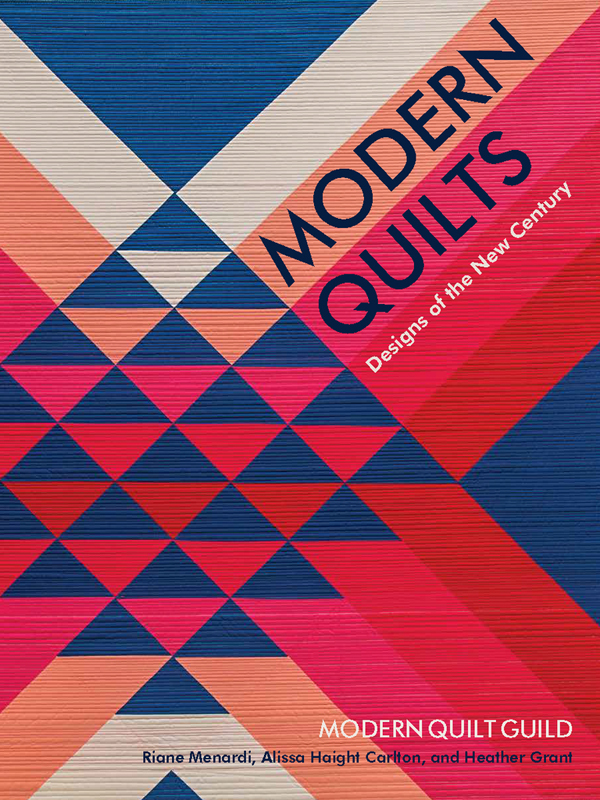 Modern Quilts: Designs of a New Century is a beautiful, hardcover book that celebrates modern quilting in the context of the Modern Quilt Guild. 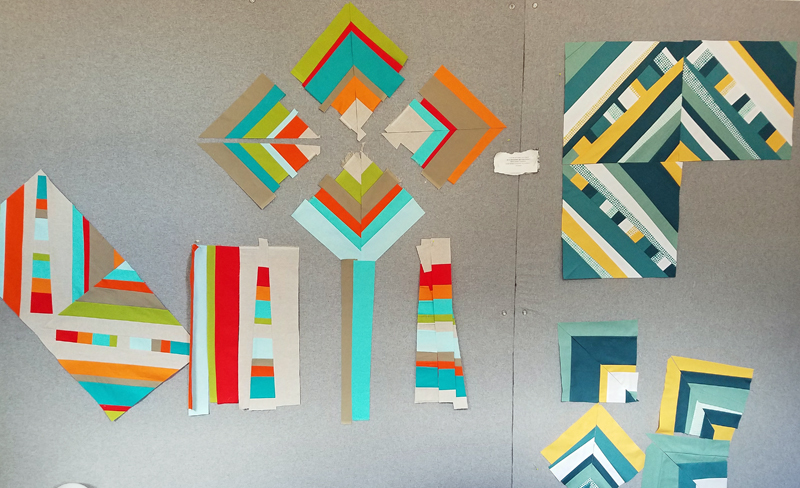 It was curated by Riane Menardi, Alissa Haight Carlton and Heather Grant. 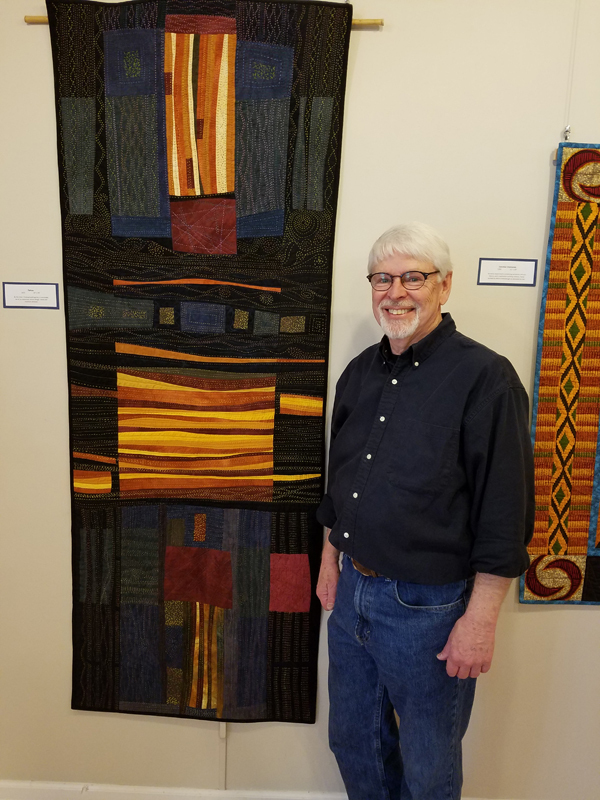 The retrospective includes over 200 quilts, a brief history of the modern quilt movement and descriptions of characteristics found in modern quilts. 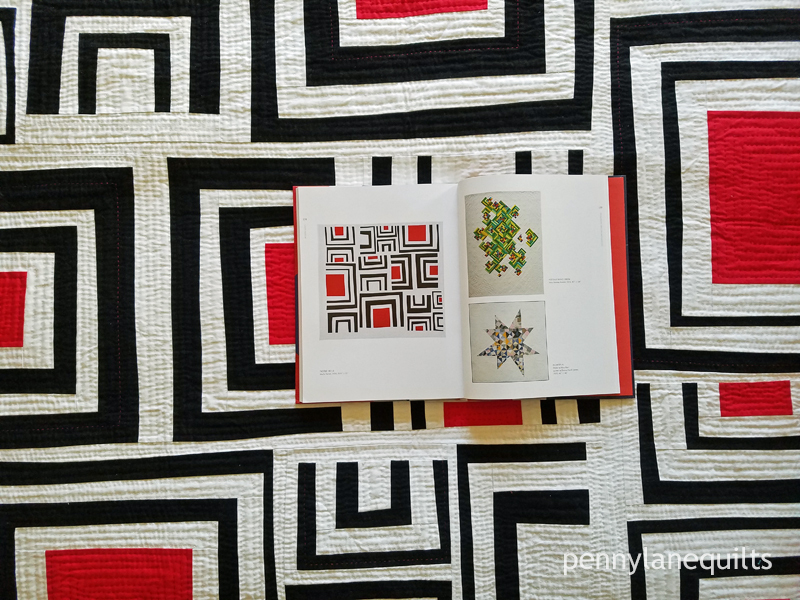 Two of my quilts were selected for the book: Coral Reef and Trestle Nestle. 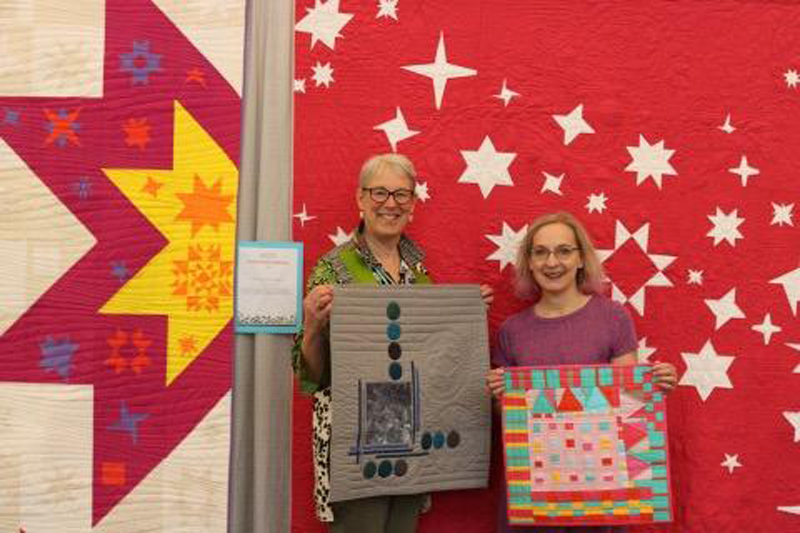 It’s a bit of a thrill to have them included and to see them in the company of so many quilts I admire. 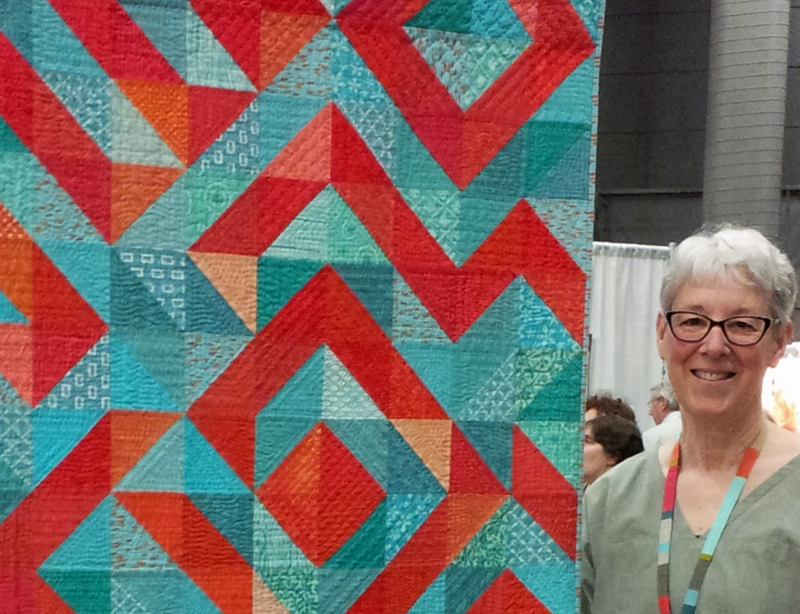 Coral Reef appeared at QuiltCon 2015 in Austin, the first major quilt show that I entered or attended. 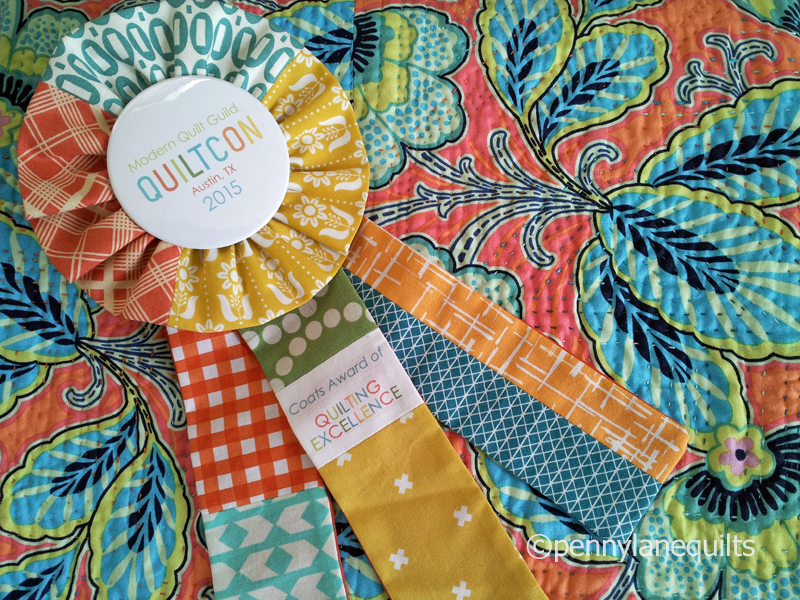 What a surprise it was to win the Quilting Excellence Award that year! 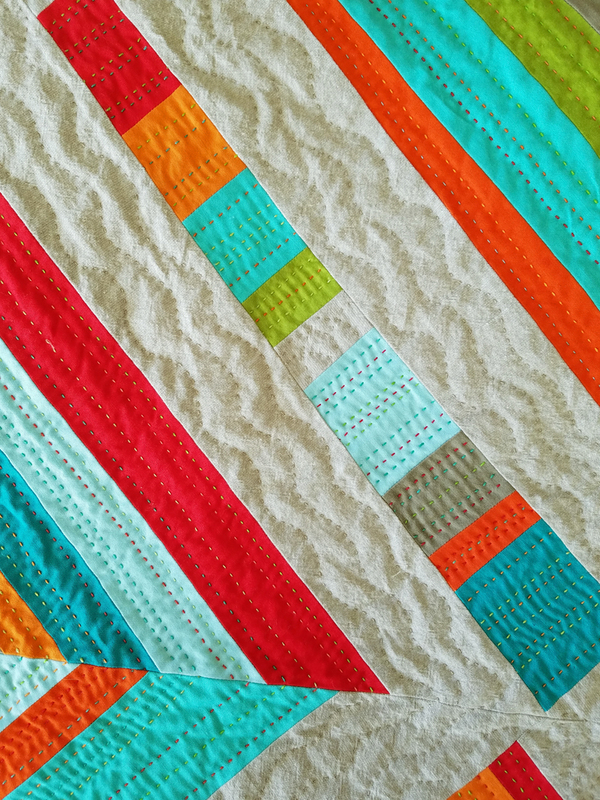 All those lovely hours of hand quilting make this one of my all time favorite finishes. You can read the rest of the story about Coral Reef in this post. 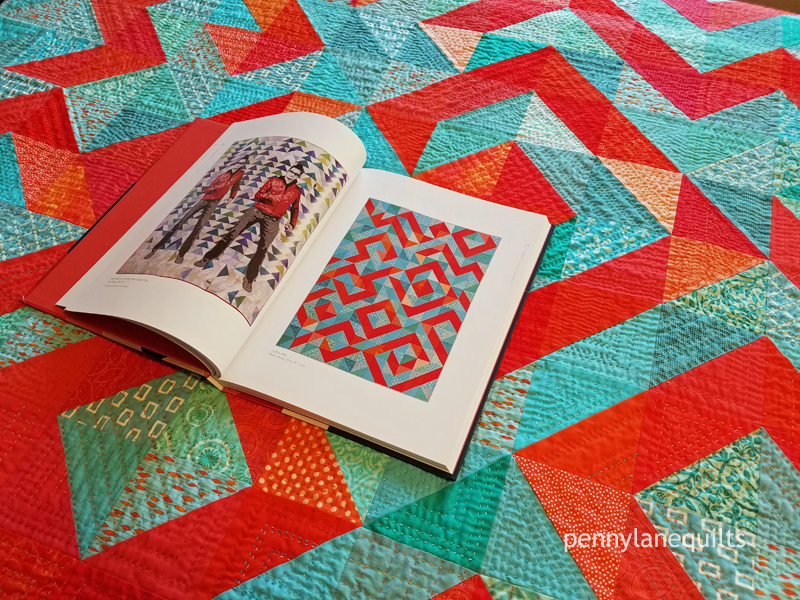 The large format of the book allows the quilts to take center stage. 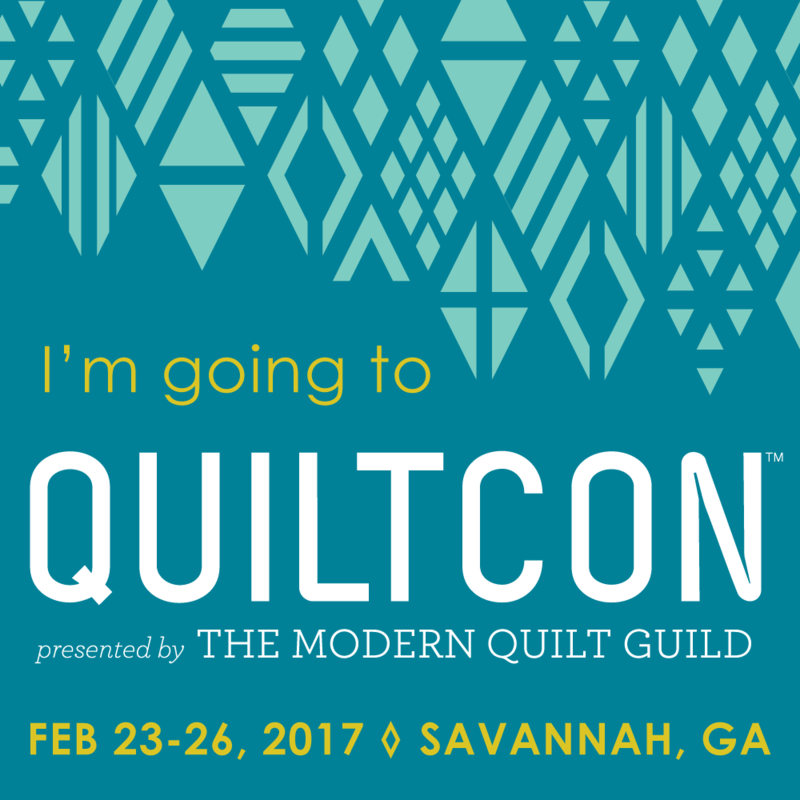 Trestle Nestle was selected to go to Savannah last year for QuiltCon East 2017. 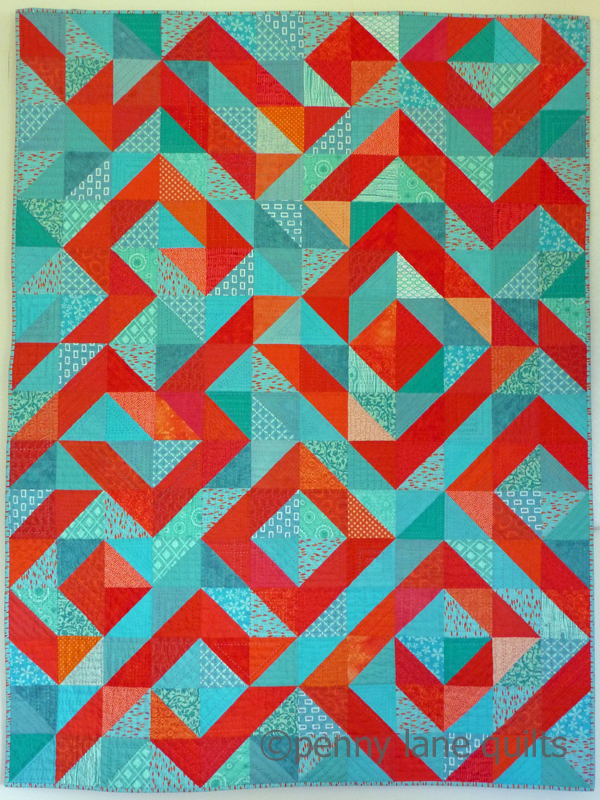 Improvisational piecing and hand quilting, my favorite techniques, are used in this quilt. 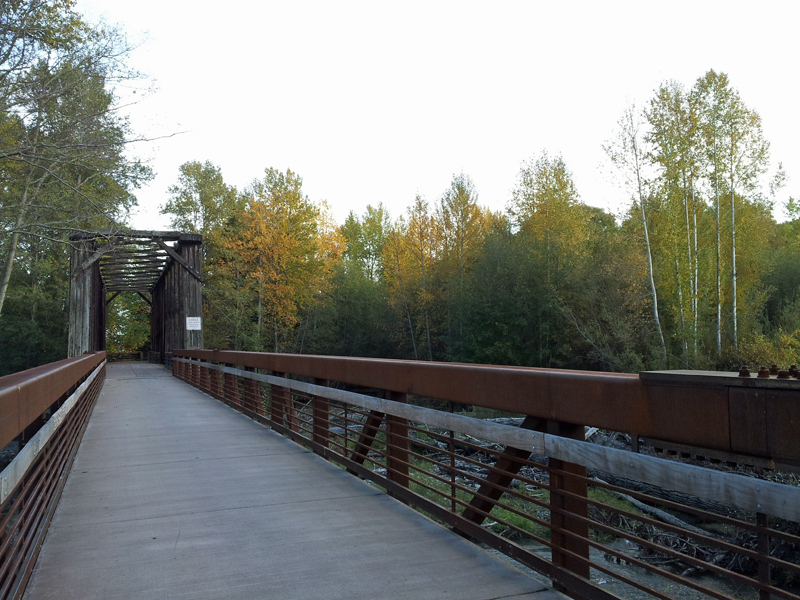 The motif was inspired by a local railroad trestle on a wonderful walking and cycling trail near my home. Here it is on Christmas day, decked out in its festive finery. 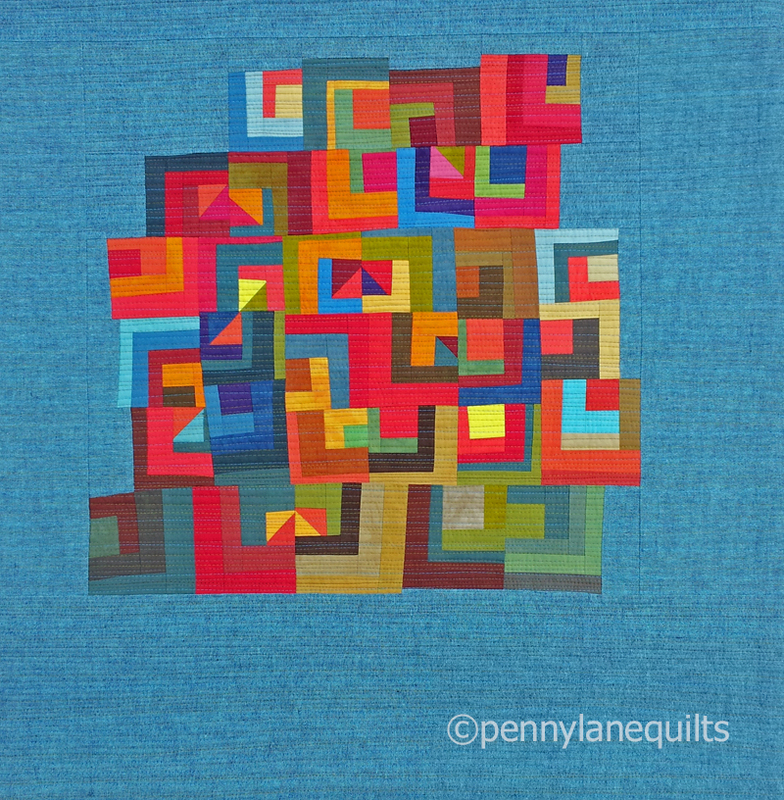 It has been so interesting to read the backstories of many of the quilts included in the book. 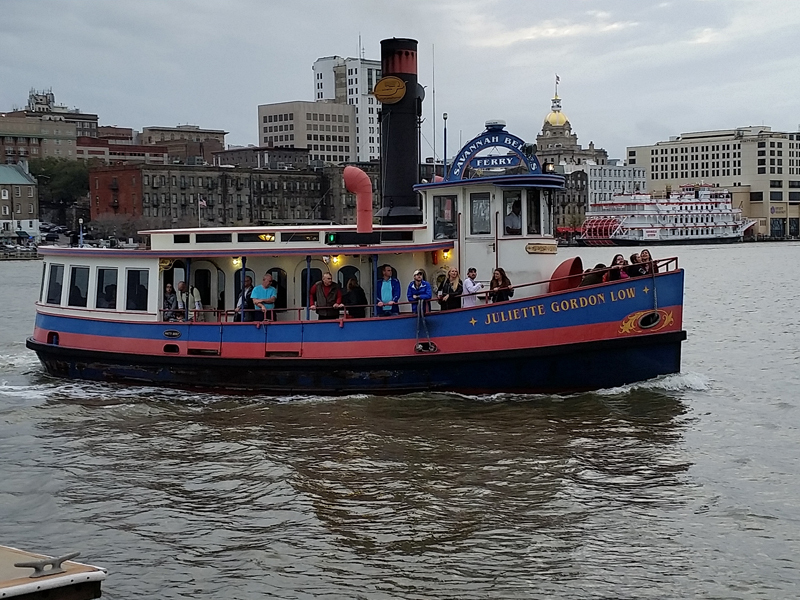 Below you’ll find links to all the sites in case you’ve missed some along the way. 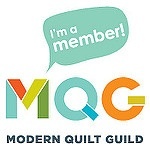 When you purchase directly from the MQG, 100% of the profits and royalties of your purchase benefit the Modern Quilt Guild, a non-profit 501(c)3. 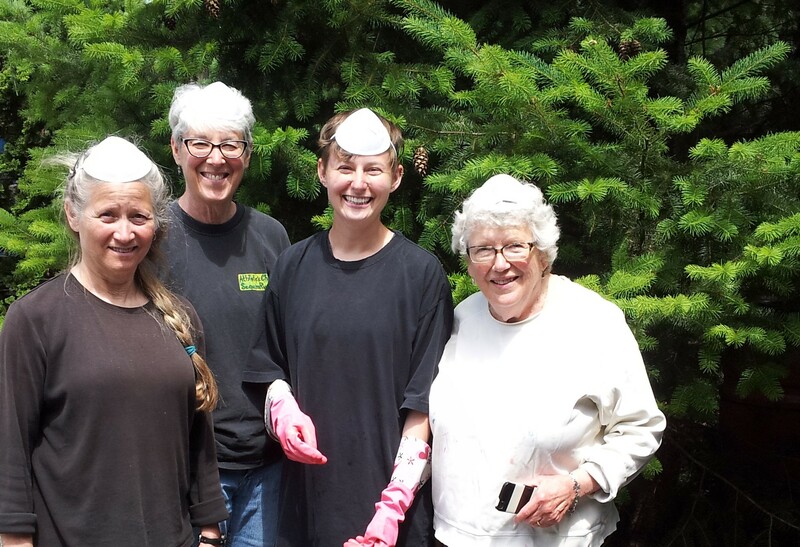 This weekend I’ll be at a retreat with my friends from the Bainbridge Island MQG and I’ll be taking my copy of the book so they can enjoy it, too. I’d love to hear your comments and I’ll reply just as soon as I get back home. 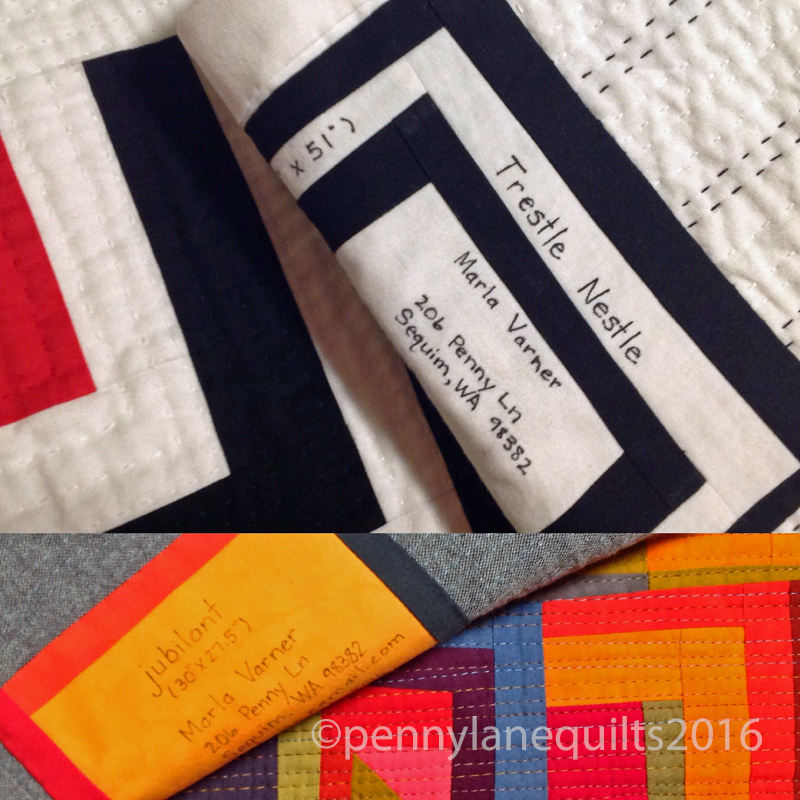 The first week of the new year began with getting a couple of quilts prepared for QuiltCon East in Savannah and getting them shipped. 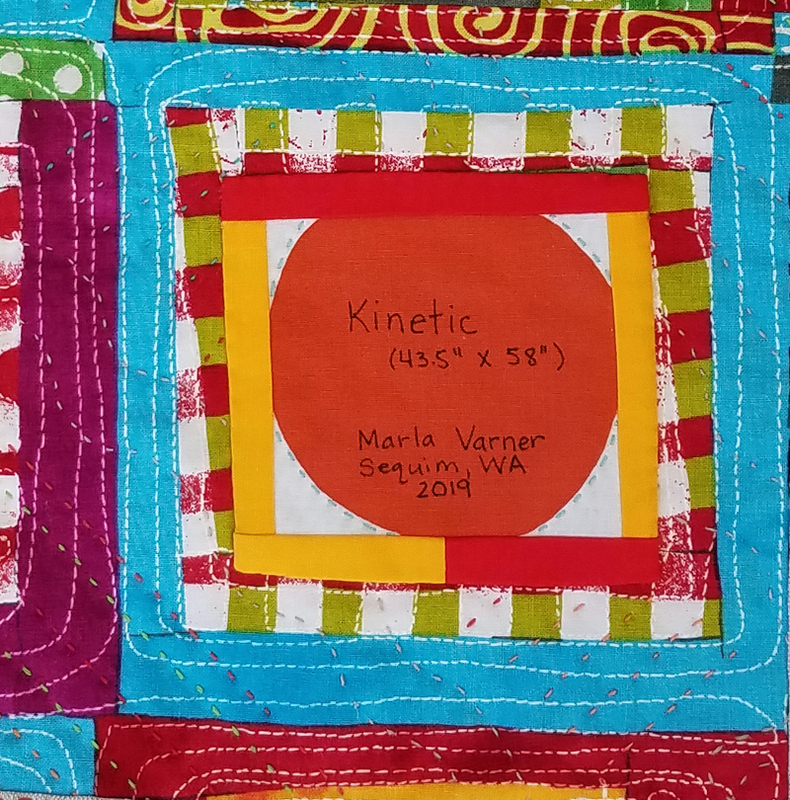 I am very excited to have two quilts juried into the show this year. 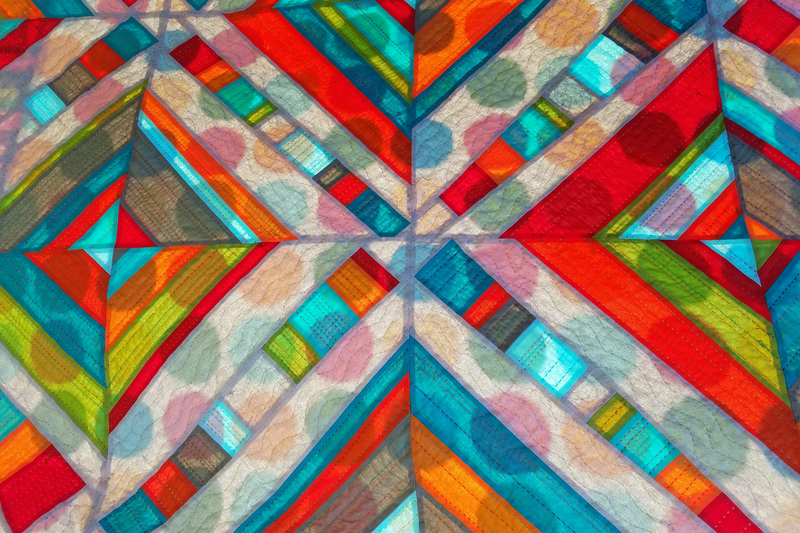 The first one is titled “jubilant” and it is entered in the Small category. 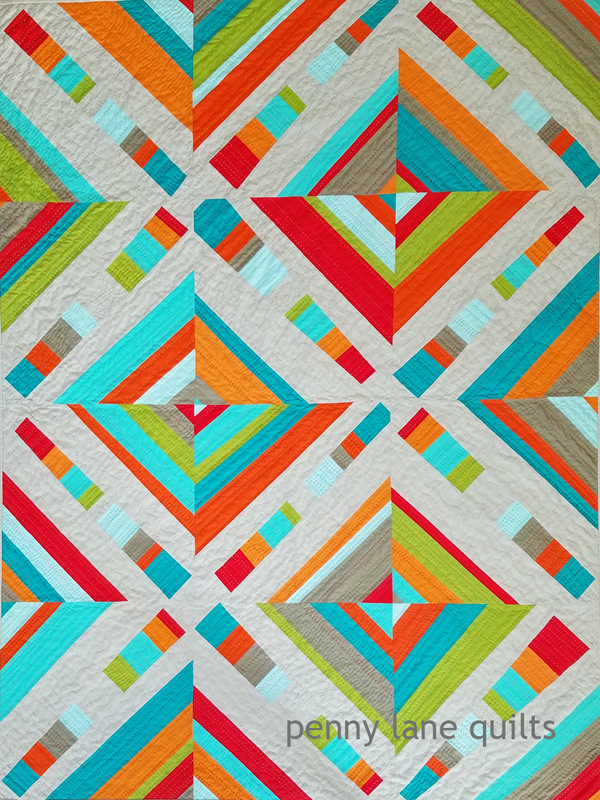 The second quilt is called “Trestle Nestle” and it is entered in the Handwork category. 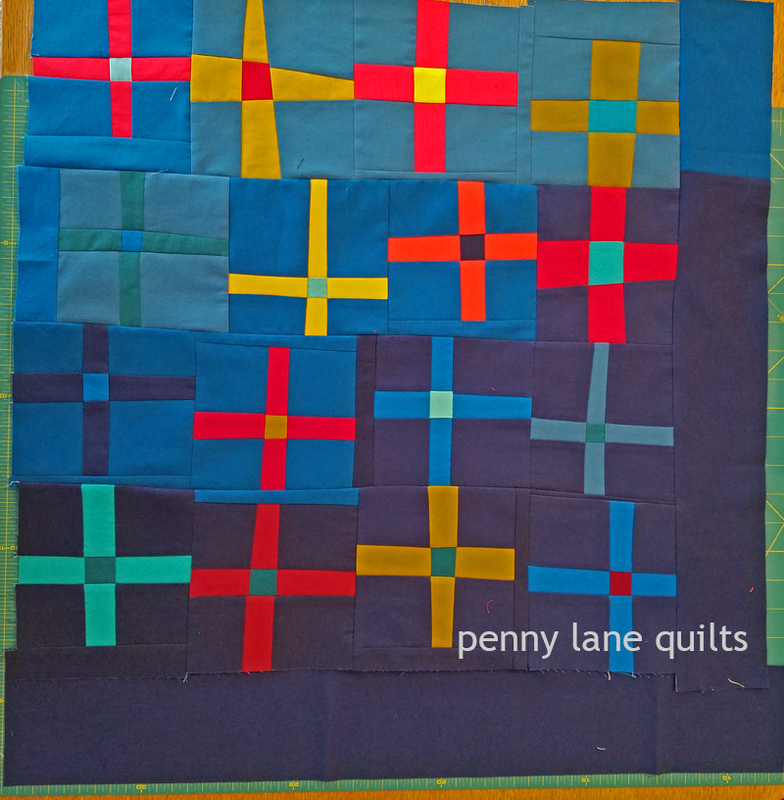 The shapes for this quilt were inspired by a local trestle on a trail where I enjoy walking and cycling. 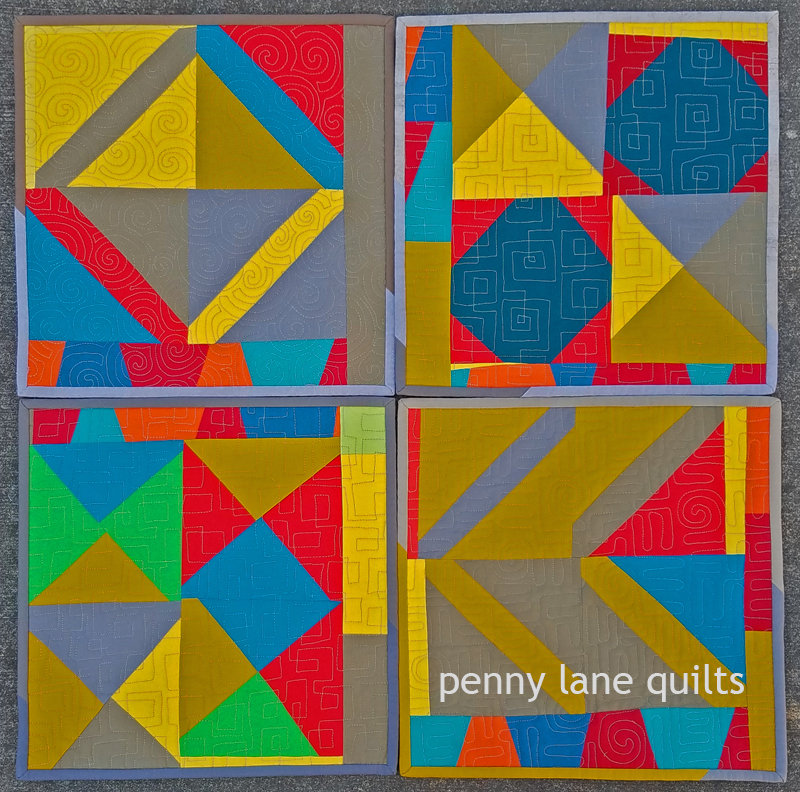 Sleeves and labels were attached, and instructions printed. It always seems to take me longer than I expect to prepare for shipping! 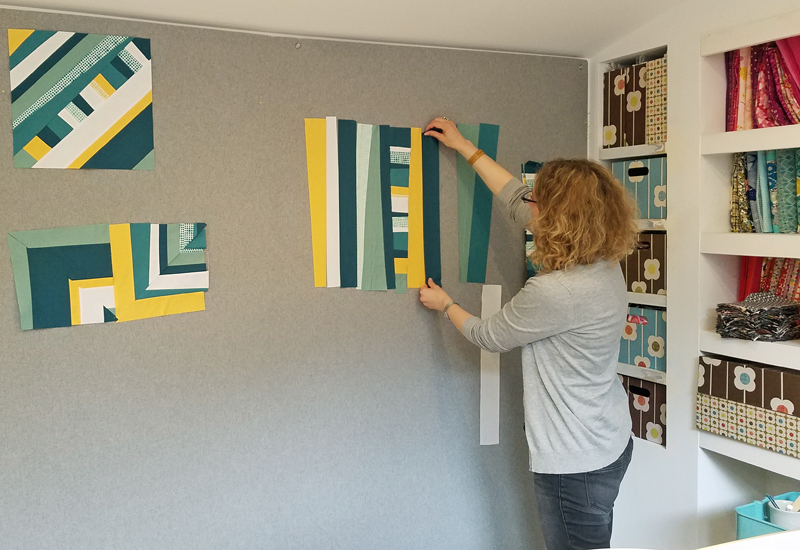 The first hurdle is finding a box the correct size. In the past, I have been happy with a box that I was able to purchase at the UPS store, but they didn’t have any in stock this time around. 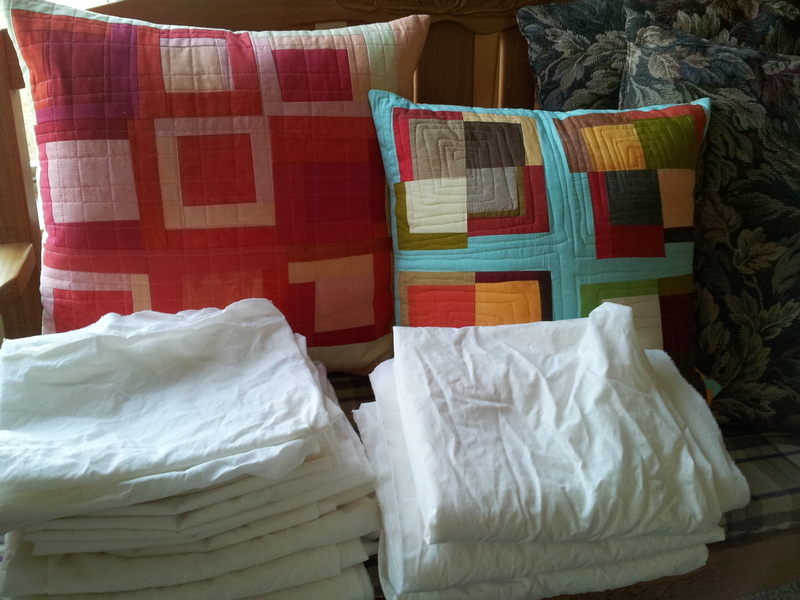 (The recommendation by shows is that you put the quilts in a new box because boxes can become weakened when used.) Since I wasn’t able to locate a new box, I ended up reusing a box, but I reinforced it with a LOT of packing tape. 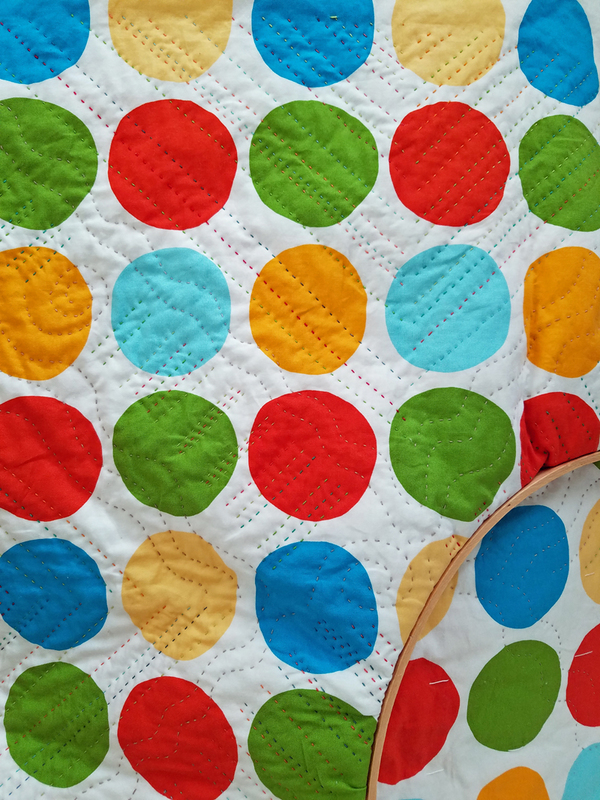 Then there is the plastic bag to keep your quilt safe from the elements. 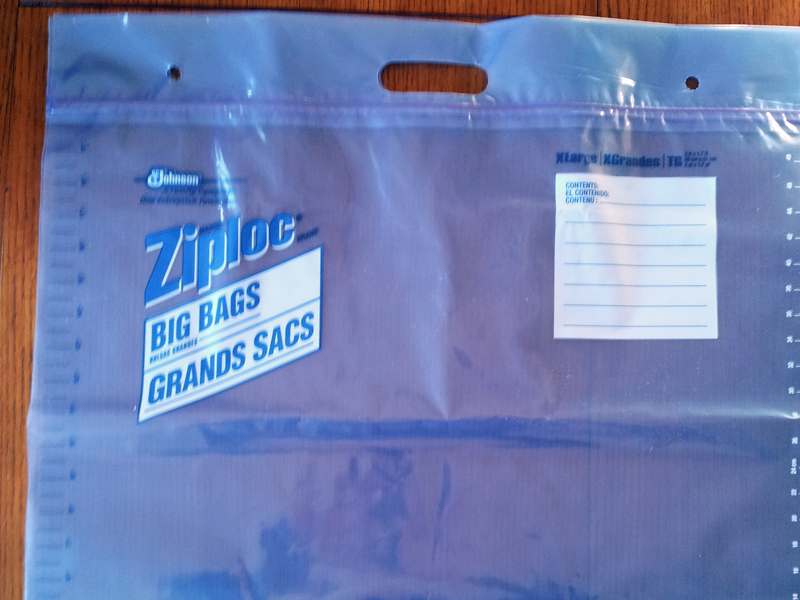 Recently, I have been using XLarge Ziploc® bags. 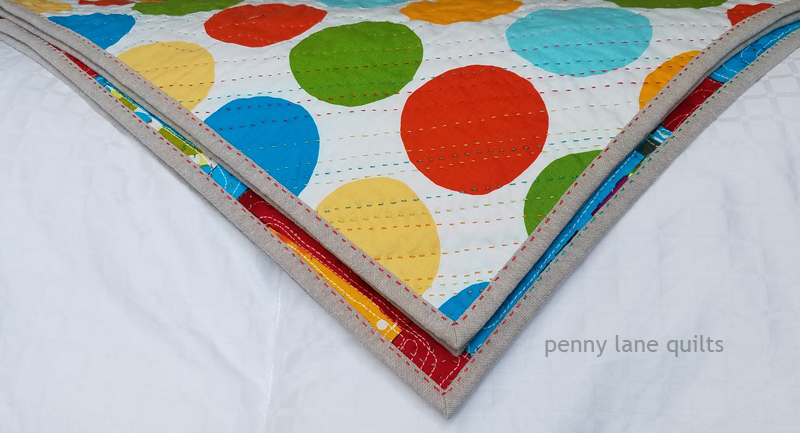 They are sturdy, reusable and measure 2 ft x 1.7 ft. It always makes me a little nervous when I drop that package off at the post office. 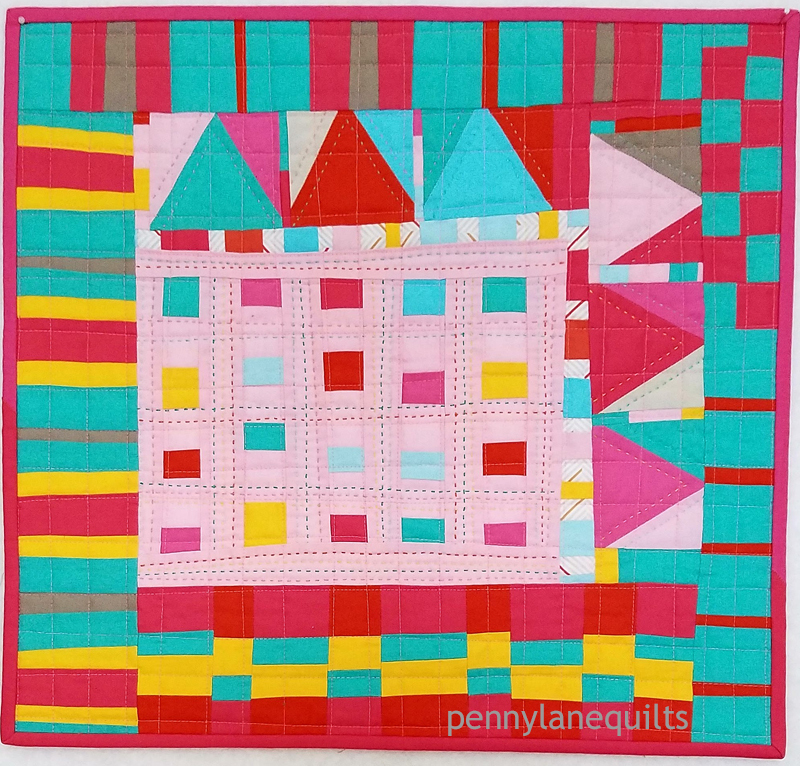 I sent it with a signature required, so I will be tracking it today and making sure it arrived safely! 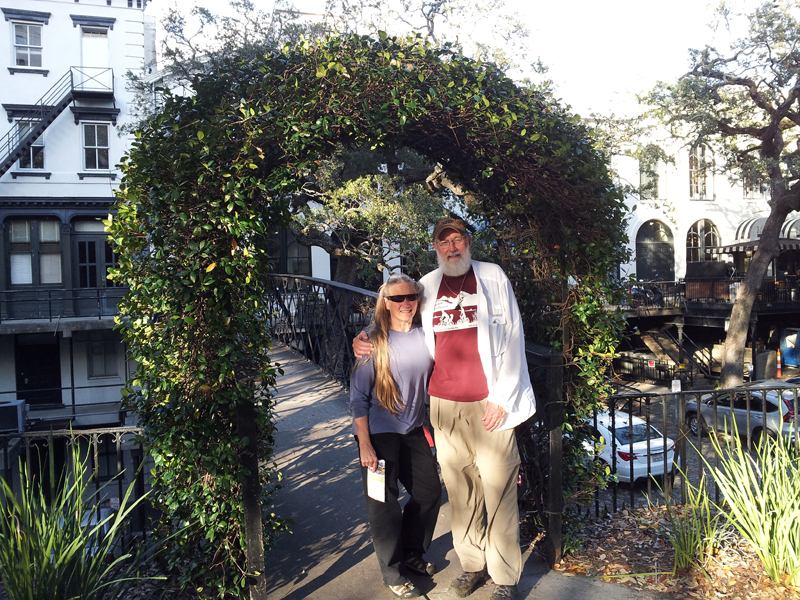 It won’t be long before I will need to get myself ready to travel to Savannah. 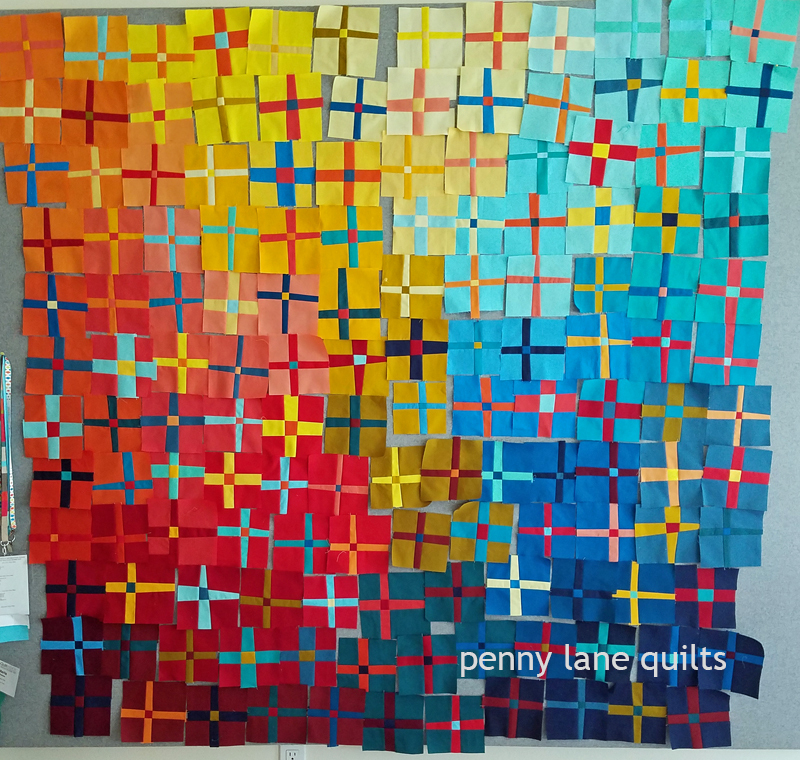 Last night, while watching a wonderful MQG webinar featuring Anna Boenish, I was reminded of the many benefits of English paper piecing. First of all, it’s portable. I keep my kit ready to go and it’s the project that I throw in my bag when I know I’ll have spare moments waiting for an appointment, riding a ferry, watching a ball game or being a passenger on a road trip. 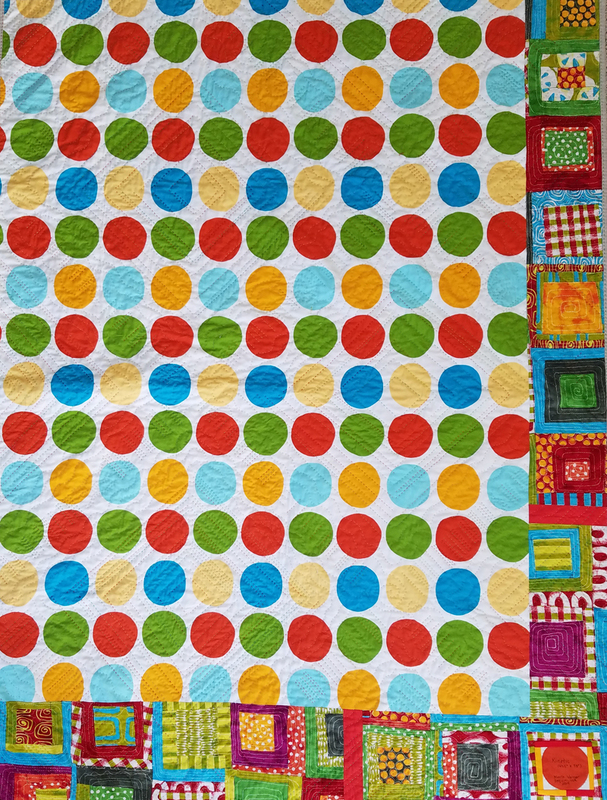 Secondly, because you only need a few materials and hardly any space, it’s ideal for stitching in any location. 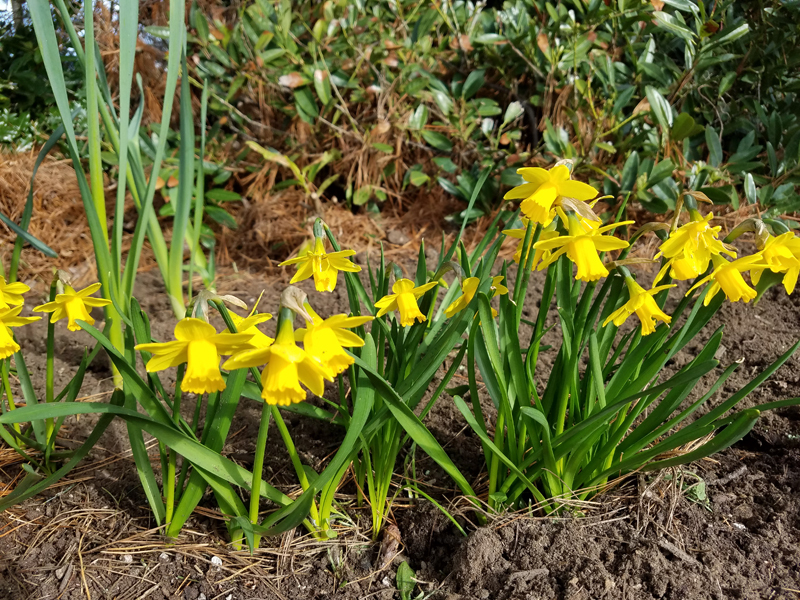 Indoors or outdoors, you can literally use this technique anywhere! 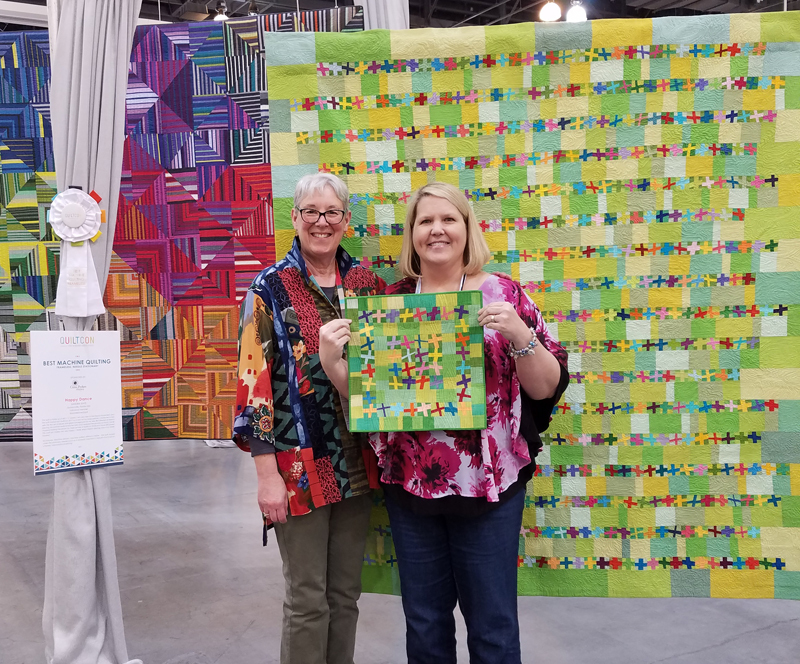 Another great benefit is that EPP, like other handwork, lets you be social and visit with friends and family while still making headway on your project. 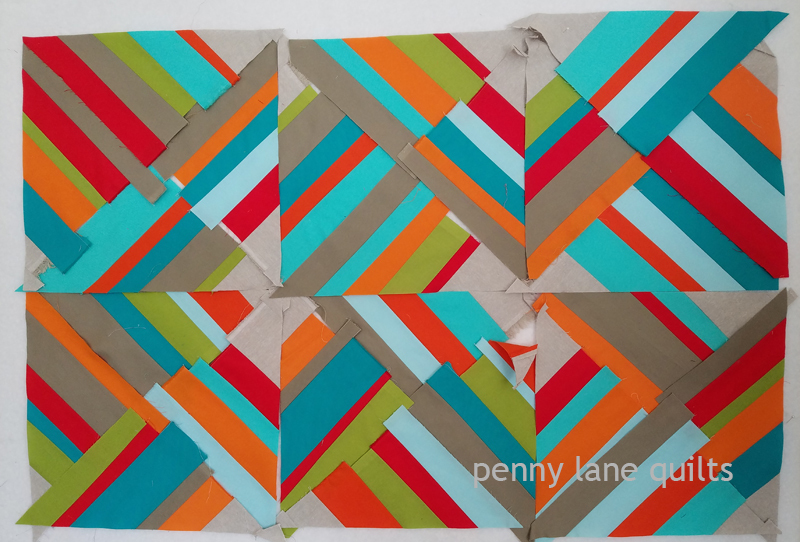 EPP is also a slow process. 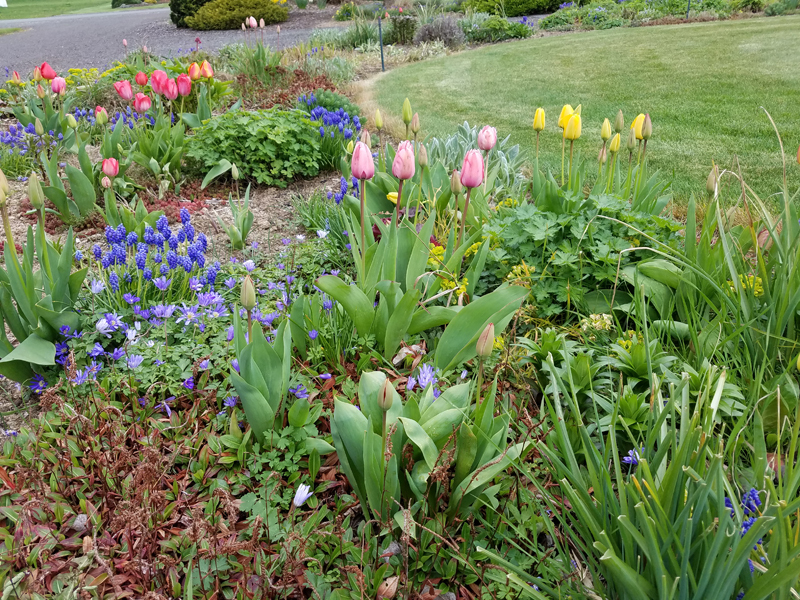 Now this could be seen as a benefit or a drawback, but in my opinion, slowing down is often a good thing. 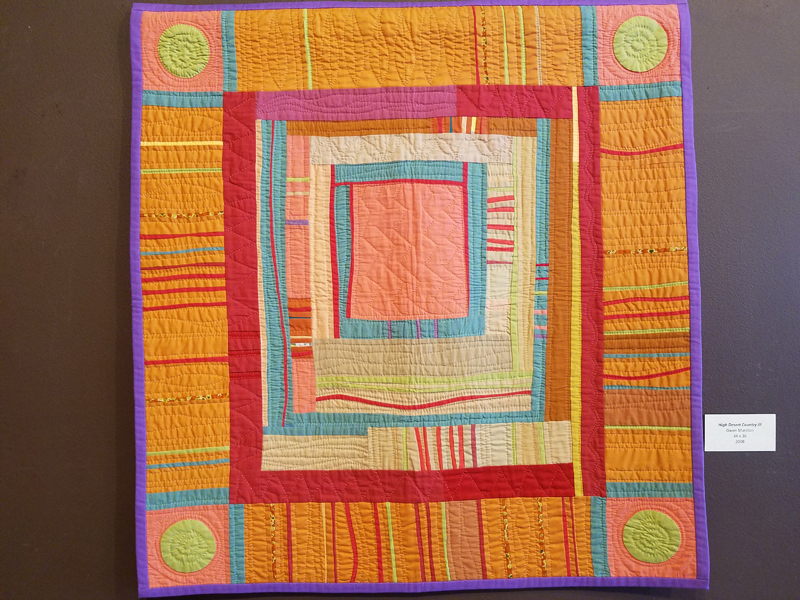 If you have a design that requires precise or intricate work, EPP is definitely a way to accomplish this. 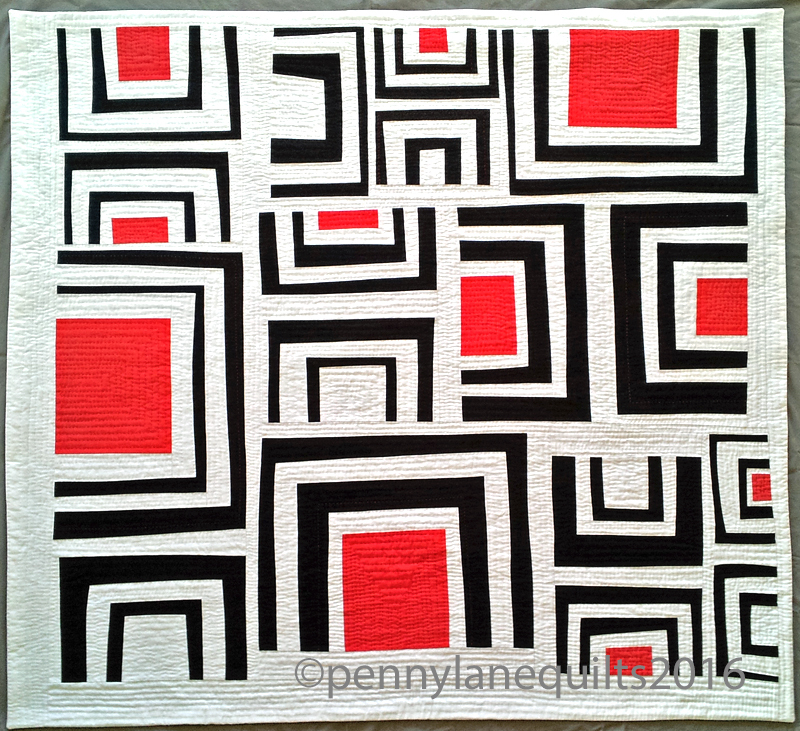 It is also well suited to fussy cutting. 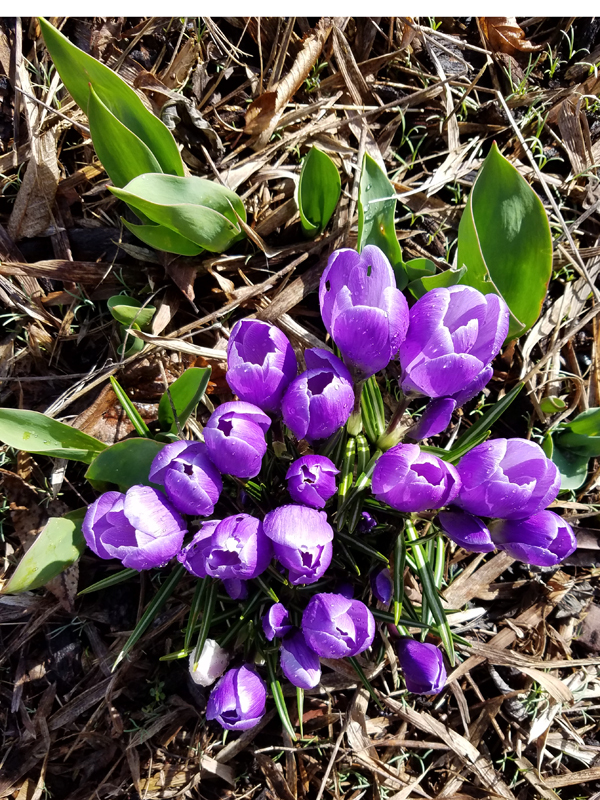 I had never really thought about it until I listened to Anna’s talk, but another thing that appeals to me is that you can begin without a plan. 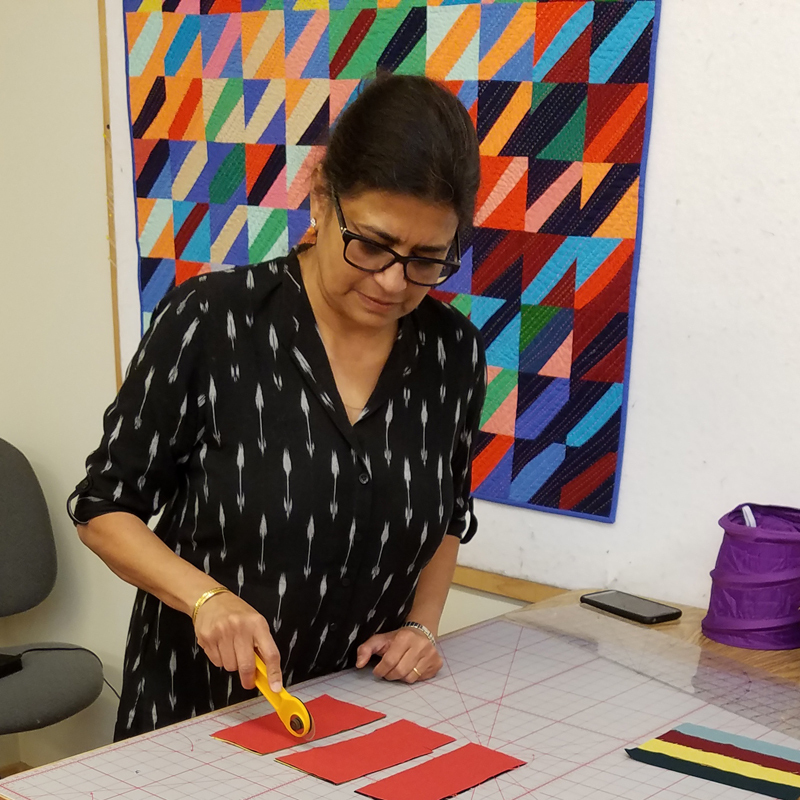 In fact, some of my traditional quilts were actually improvisational using this technique. 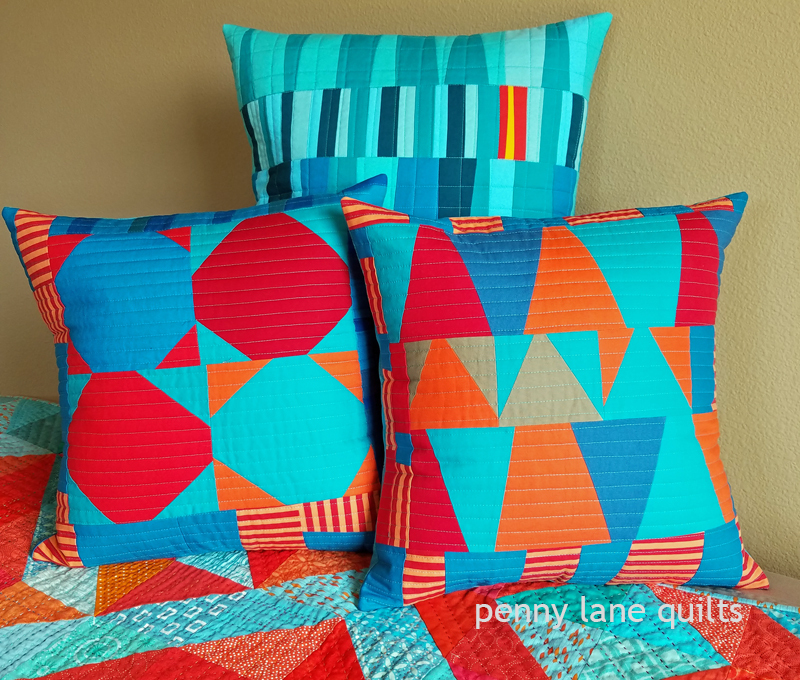 I often make units and just keep putting them together until they morph into something. 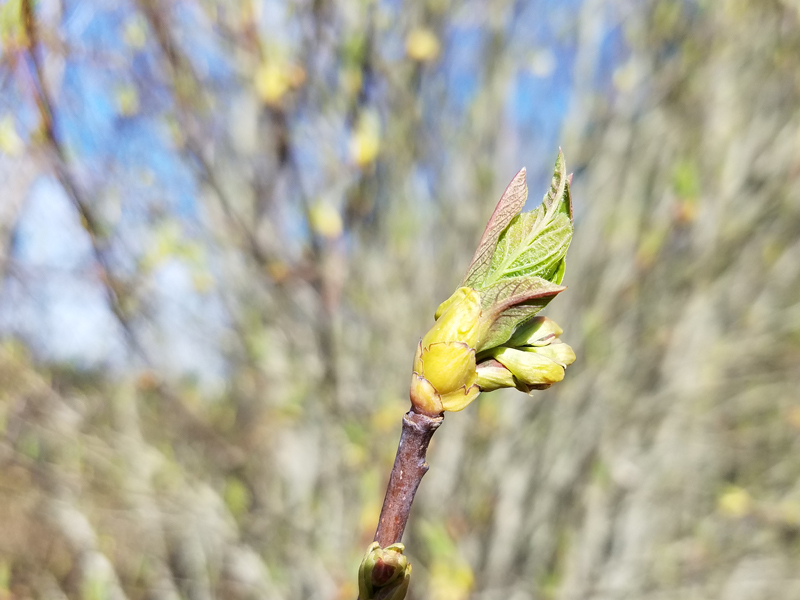 That’s how my current project is evolving. 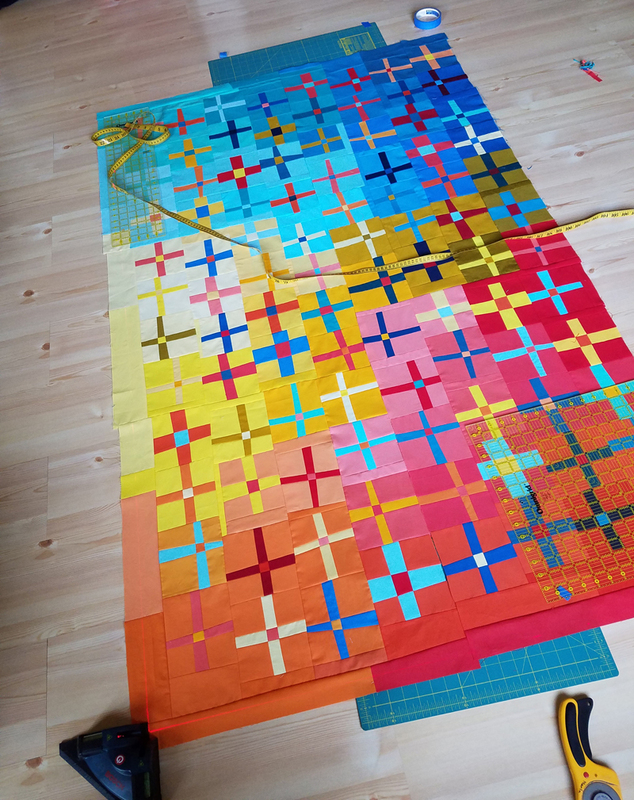 The template pieces for my epp plus quilt were created by Mollie Johanson and she provides a free template and tutorial on her blog Wild Olive. 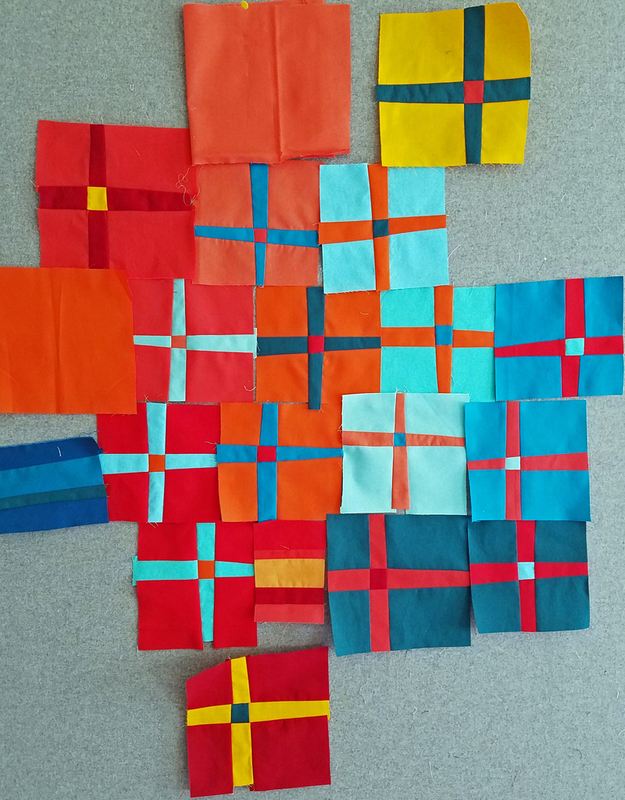 Check out #eppplus on Instagram for photos of folks using this pattern. You might even see pics of me basting in the truck while heading over Snoqualmie Pass. 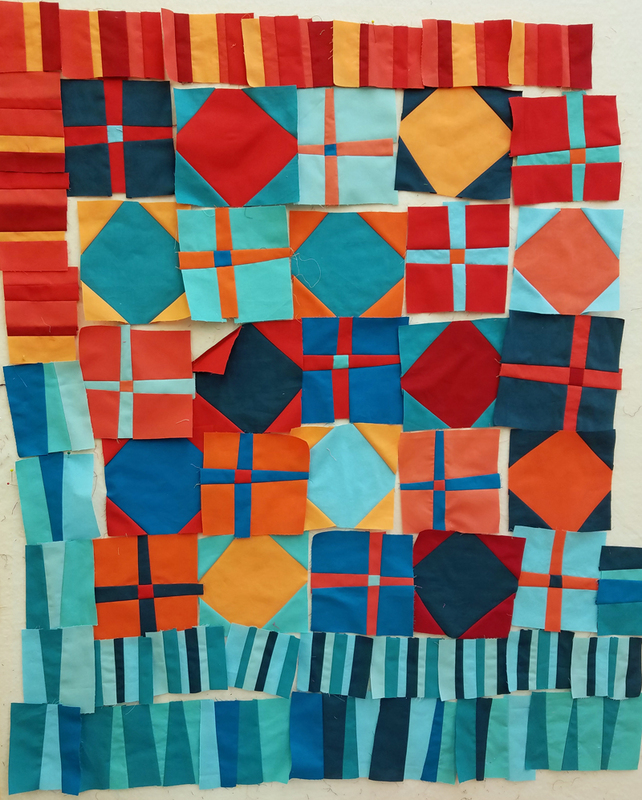 The current state of my epp plus quilt, May 20, 2016. 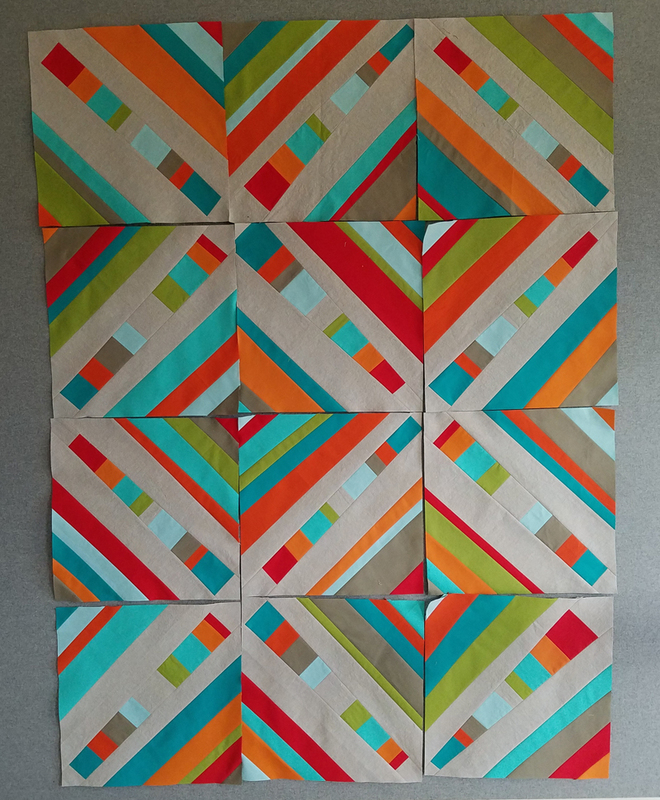 Getting ready to attach more plus units. If you are interested in learning how to English paper piece, just do a search of the topic. There are great resources and tutorials available. 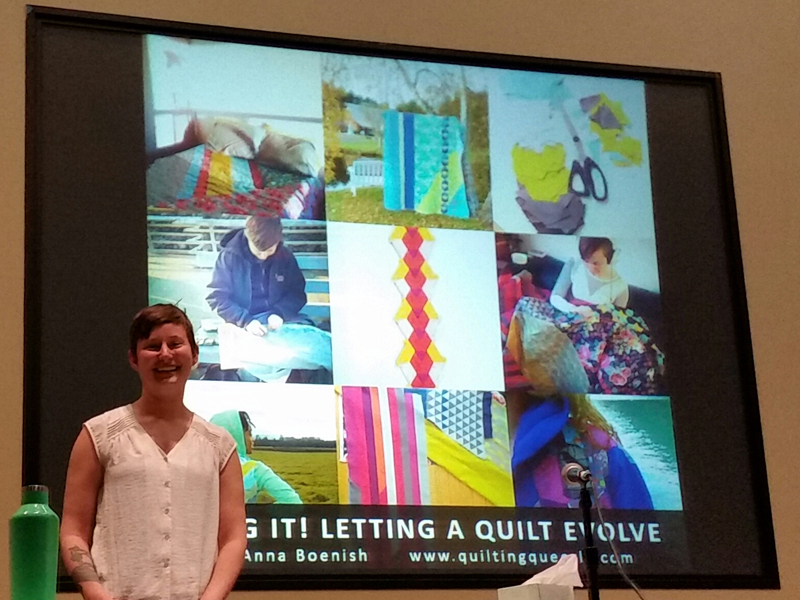 And, if you’re a MQG member, but missed Anna’s webinar, log into the Community section of their website. Under the Resources tab, you’ll find a list of all the past webinars available. Just one of the perks of being a member! 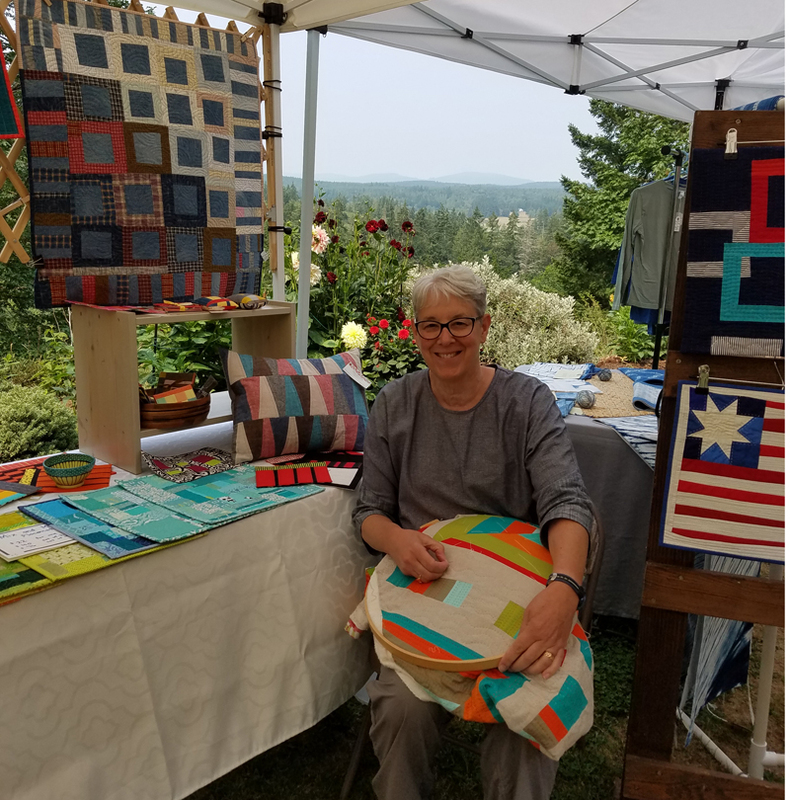 You can also find her work, and the unique ways she uses English paper piecing on her website Quilting Queerly or follow her on Instagram @quiltingqueerly. 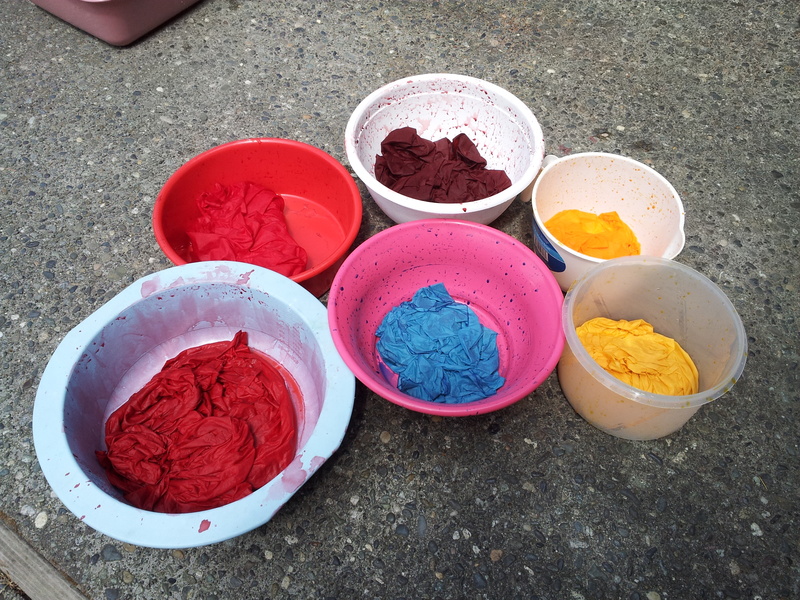 Our weather has been perfect for dyeing fabric! 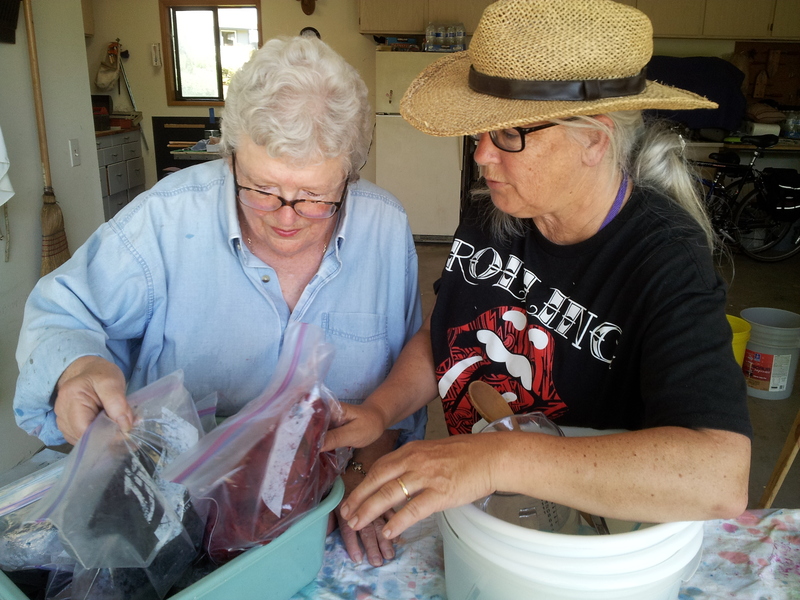 Here are a few photos to share from some recent dyeing sessions. 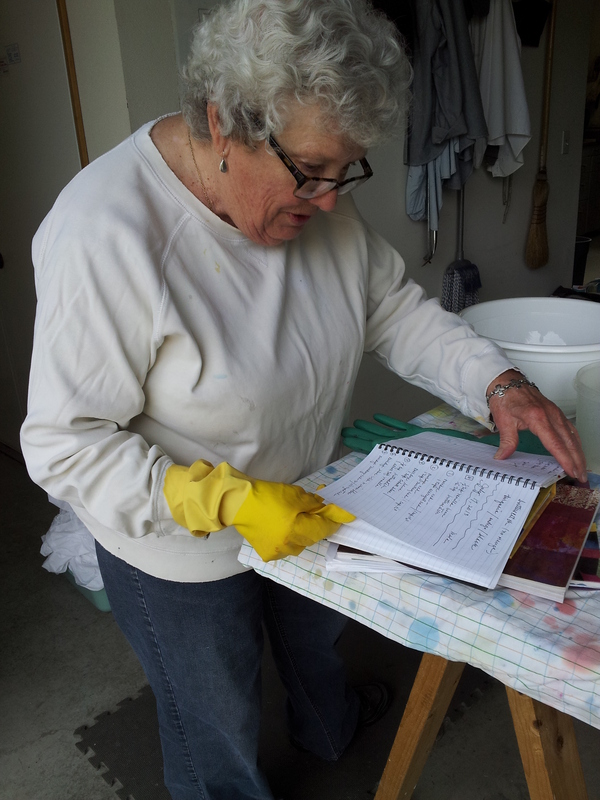 First, the fabric is “scoured” by washing in warm water with soda ash and Synthrapol. 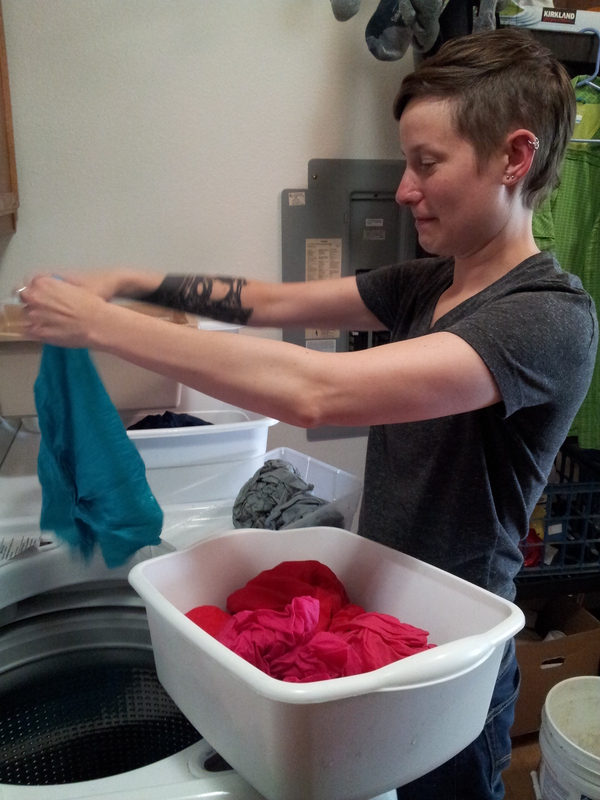 It is then dried in the dryer. It’s helpful to refer back to notes from previous sessions. 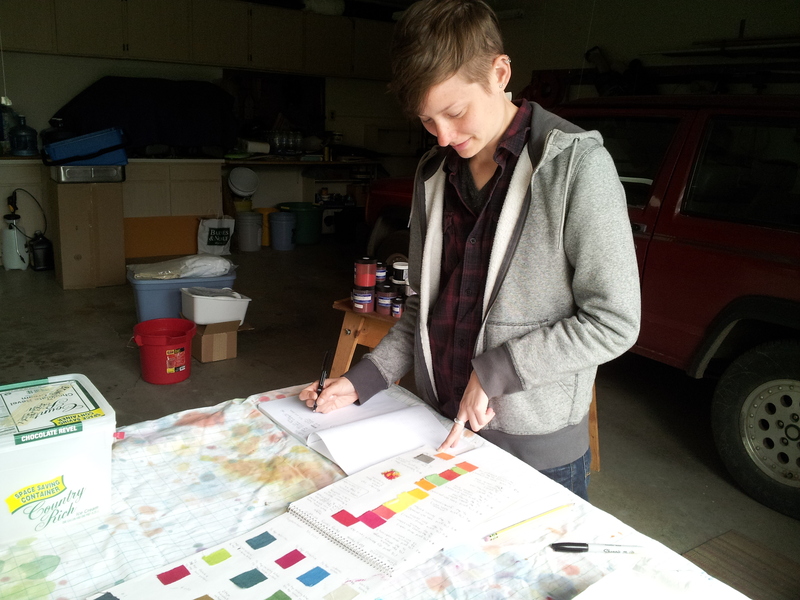 A journal (complete with fabric swatches) helps to inform choices for new color experiments. 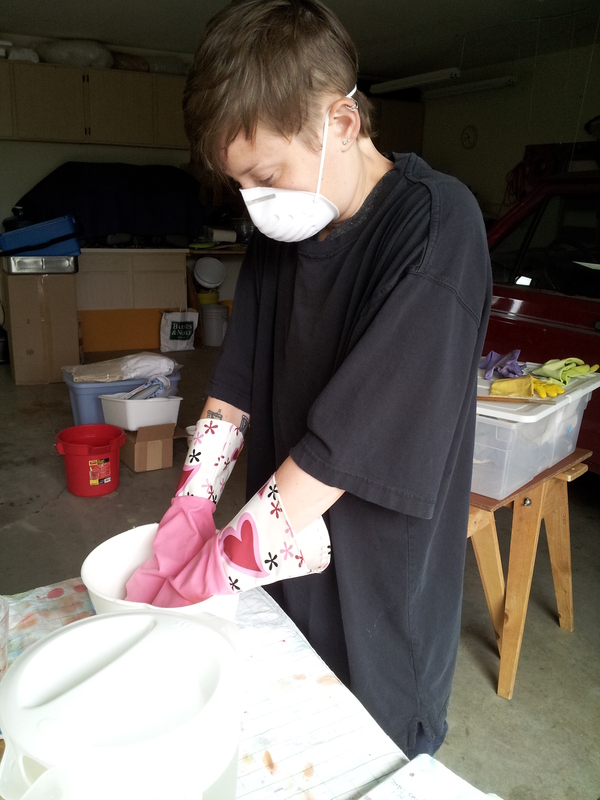 A dust mask and rubber gloves are necessary safety precautions. 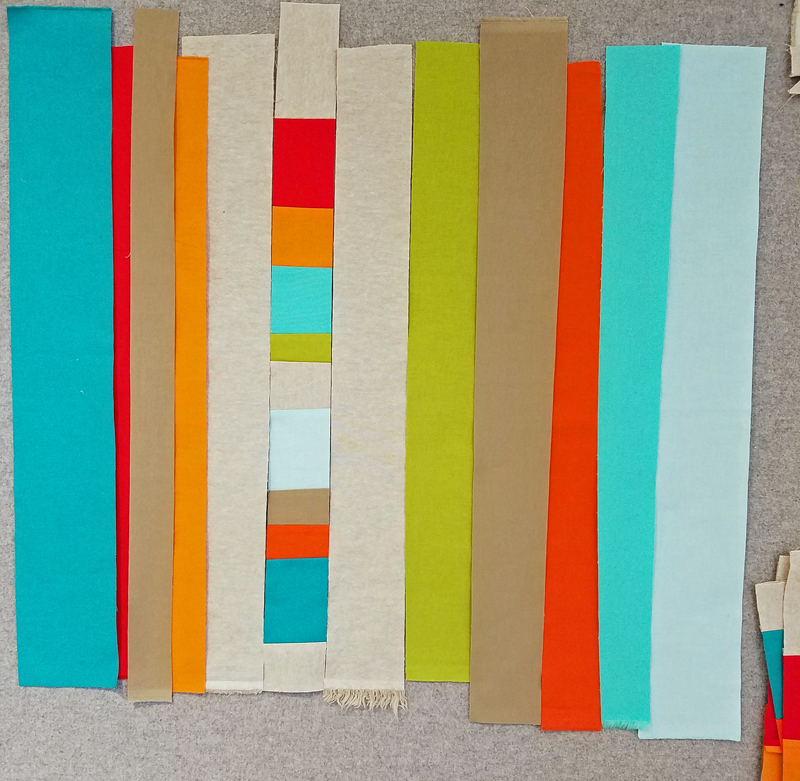 Some beautiful fabrics are waiting for the soda ash fixative to be added. Each piece was placed in a plastic bag while it cured. 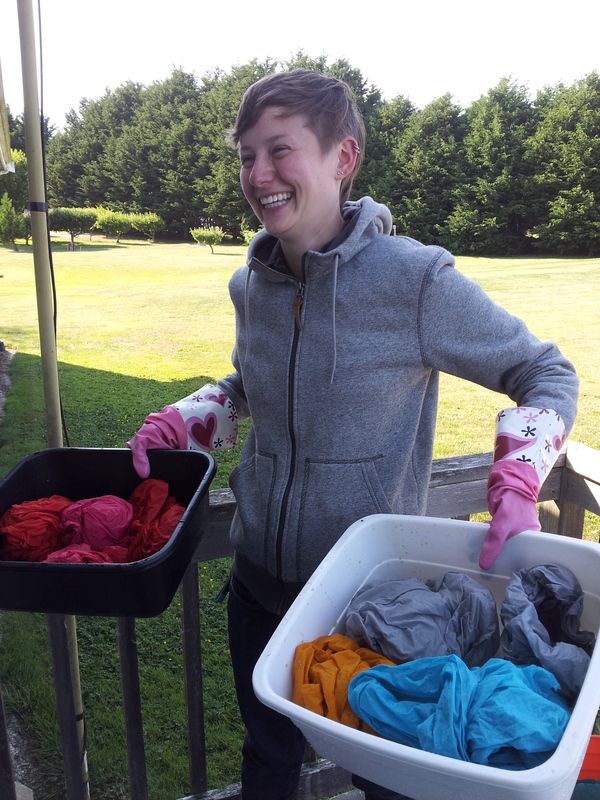 These fabrics were first rinsed outdoors in cold water to get most of the excess dye removed. 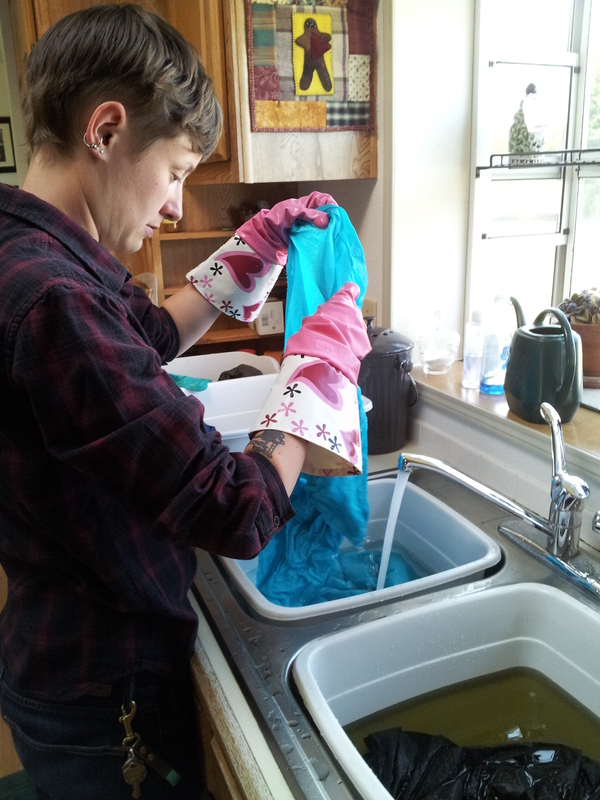 Then they were given another rinse indoors with hot water. The final wash and rinse is in the machine, adding Synthrapol to remove excess dye. 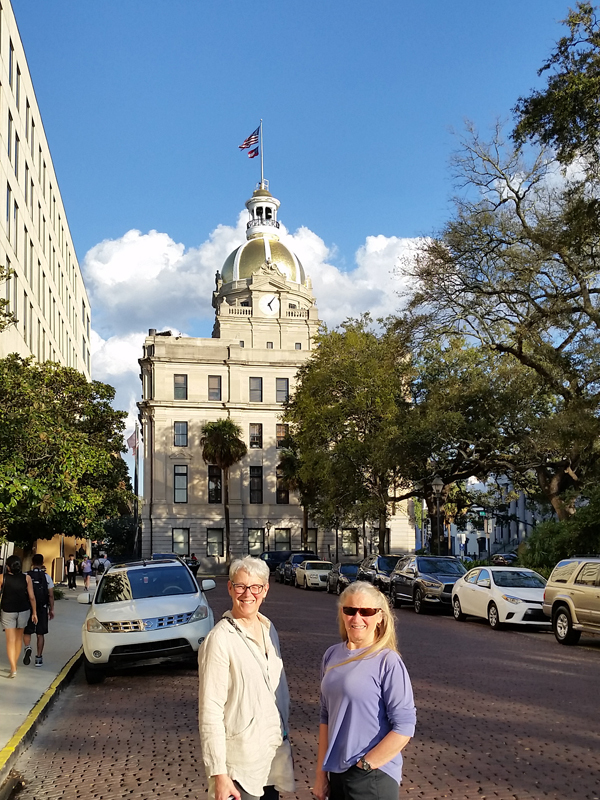 And what could be more fun than sharing the experience with great friends? 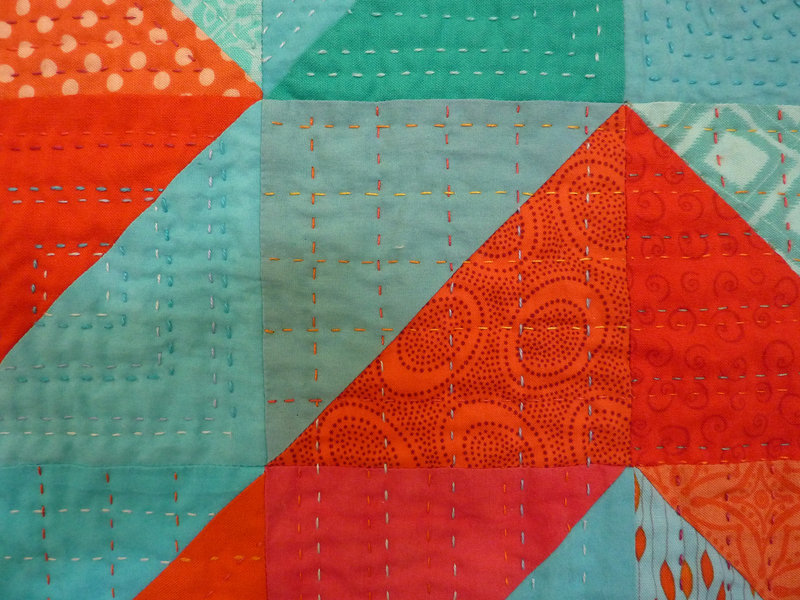 I can’t wait to see what everyone creates with their new fabric choices!